This is a continuation of the CAFE Horizons survey. ( Other posts in this series can be found either by clicking on “CAFE Project” in the Tag Cloud or by clicking on “GrumbleSmiles Trust” in the Topics list). This question is already partly covered by the earlier question related to holidays and places in the world people would like to visit. Beyond that this group no doubt have all sorts of other ambitions which they would to include in their “bucket list”. At the ExtraCare Charitable Trust, we enabled people to loop the loop in a glider; to go ballooning; to go parachuting; to drive sports cars around Silverstone; to ride on an Harley Davidson; to drive a tank; to climb the Three Peaks challenge; to walk the length of Hadrian’s Wall; to go swimming with Sharks; to act in pantomimes with TV personalities; to perform on stage at Symphony Hall in Birmingham; to make a record; to hold an exhibition of parrot feather pictures; to abseil with one of the “Gladiators” and many, many more. Not everybody wanted to do these extreme things but there were certainly inspired by the people who did. 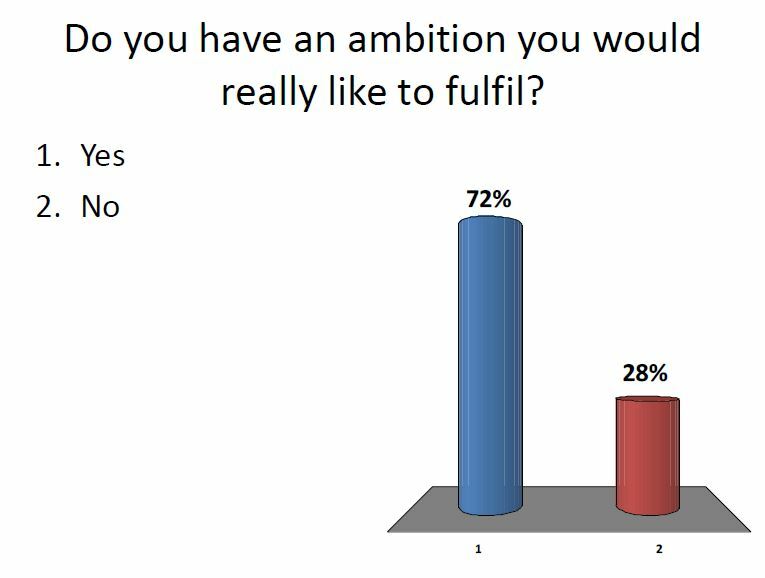 Footnote: It would be good to expand this question and see exactly what peoples’ ambitions are and how they might be fulfilled with the mutual support of other older people. An APP that matches ambitions with offers of support would be useful.